Storm Over Warlock by Andre Norton (1960) is the first book in the Forerunner series. Shann Lantee is an undersized young Terran who clawed his way out of poverty and an abusive society in Tyr to make the Survey Corps. His lack of education leads to what most team members think of as a menial job in Survey, that of taking care of the genetically altered animals traveling with the team as they prepare planet Warlock for settlement by humans. Lantee, however, sees his role in Survey as a step up, and just being at Warlock is a matter of personal pride. Warlock is the second planet in the Circe star system, surrounded by the Witch and Wizard planets, both uninhabitable to men because of their environment. Norton begins this adventure with danger and action as Lantee helplessly witnesses how the beetle-like Throgs, attack and wipe out all men at Survey's camp before they are able to place a security net around the planet, leaving him as the sole human survivor. Lantee left camp during the night to track down his ever-exploring wolverines, but now he's both scared and frustratingly furious. The survival instinct kicks in as he and his wolverines go into the Warlock wilds. Lantee's childhood experiences serve him well when forced to use survival instincts and abilities and his confidence soars, but soon he encounters his idol, Survey Officer Ragnar Thorvald, who made his way back onto the planet for reasons of his own, and all that confidence vanishes. Lantee, Thorvald and the wolverines set off toward the sea, but between the Throgs' relentless pursuit and those dreams plaguing both men, will they survive the trek? What about the rumors about an indigenous population? Could they be true? This story with two men and a couple of genetically enhanced wolverines as sidekicks surviving the elements and fighting enemy aliens on an unknown planet, while exploring a new unknown alien culture definitely falls under the young adult space adventure category for me. This being a Norton young adult novel, I'm finding that it has something in common with the few I've read so far. The young man central to the story sets out to find the truth about the planet and in the process ends up finding the truth about himself. The uber-alien Throgs are portrayed as a race of thieves and killers who cannot produce their own technology so they kill men to obtain theirs. There is also no negotiating with Throgs, so that having no redeemable qualities these aliens are therefore deserving of nothing less than total annihilation. This is a familiar thread found in military sci fi from earlier years but I'm not surprised to find it here. On the other hand there is mention of another alien race that stands out in my mind for several reasons. This section was complex and well executed by Norton, but unfortunately I can't say more about it without giving away spoilers. I really enjoyed the wolverines, and the flora and fauna details included in the novel are just excellent. 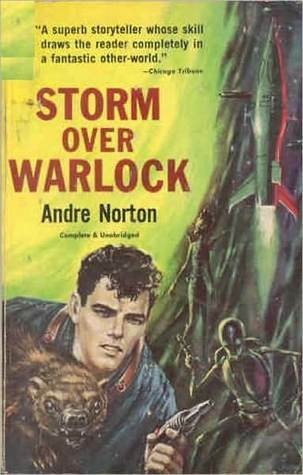 Written in 1960, this young adult story has males as central characters and a dated atmosphere (needle point rocket as a space ship for men and plate-like for the aliens), and although there is a lot of action, for some reason this story did not keep me engaged for long periods of time. Lantee's back and forth between adoration and resentment of Thorvald became a bit exhausting, as did Thorvald's outward contempt and lack of recognition of Lantee's abilities. Did these two ever really bond? They did, but how did they get there? Sometimes I wondered. . . but you'll have to read the story to find out. Covers: I really like the cover used for the digital collection Visions of Distant Shores featuring a female robot with a wistful expression on her face. However, I couldn't pass up featuring the original colorful illustrated print cover with the handsome young man pointing his blaster and holding a wolverine, the pointy rocket taking off on the background and the menacing bug-like Throg and elongated figure further back. That cover was just perfect for this story. Best Quote: "The improbable we do at once; the impossible takes a little longer." Ragnar Thorvald. I'm curious, have you ever read Robert A Heinlein? I liked Starship Troopers. I remember being blown away by some of the things Heinlein predicted. LOL But that was back in high school. I remember being blown away by the military SF razzle dazzle when I read it. I was a lot younger, but I was torn about some of the political message in it. That's why I need to go back and read it... It has been a long while and truthfully? I don't remember the little details any more. 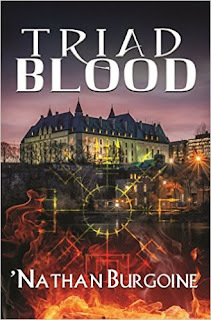 Good review - I liked the newer cover, it's lovely. I also wanted to read Starship Troopers but tried to get it from the library and I think their copy has gone AWOL... I'm sure I'll buy it at some point but I have already bought so many! I need to chill, especially on the Kindle - that 'one click' thing could become quite addictive. Lynn! The Kindle is one of the most dangerous gadgets you can own -- to your pocket. It becomes wayyy to easy to just "click" and next thing you know your pile of digital books is unmanageable.